Hi loves! How are you doing? Getting ready for the weekend already? One more day left to work, Saturday I am having lunch with a friend and some shopping after, and Sunday is the birthday of one my best friends kids. The polish I am showing you today has been shown before but it has been such a long time since I worn this and well, I usually show what I wear so why not reblog it :-)? 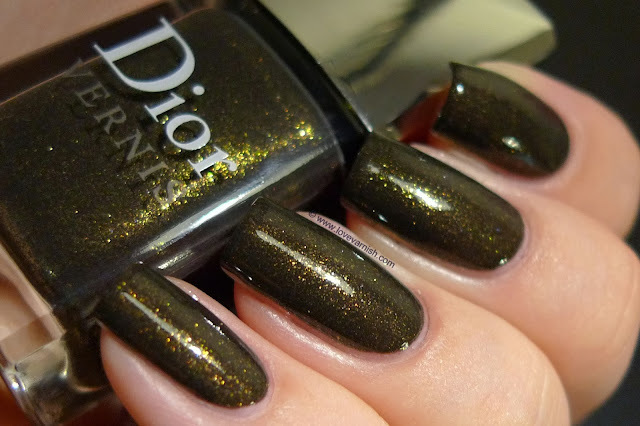 Dior Or Tsarine was released for the holidays in 2010 and one of my first expensive polishes. I fell in love with it after seeing it on Vampy Varnish (unfortunately her pictures don't seem to show up anymore). When I ourchased this I felt so grown up, LOL! The brush does take getting some used too - it is so wide and tapered! But, with the skill I've got now compared to 3 (!) years ago, it really isn't that much of a problem anymore. The base of this polish borders between a brown and very dark olive color, I can't say for sure. 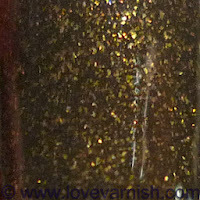 The beauty lies in the golden flakes, that really light up the polish. 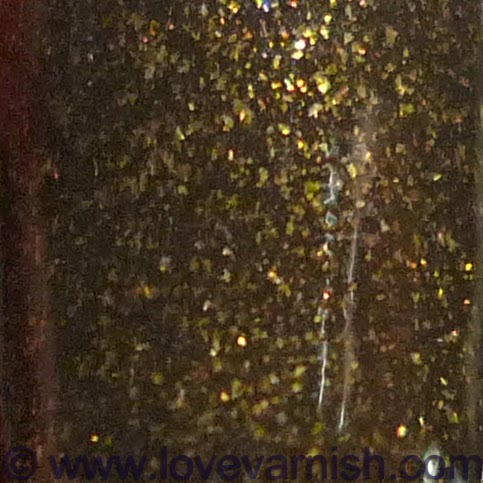 It applies nicely, even and opaque in 2 coats (like such an expensive polish should) and combined with topcoat it dries to a gorgeous shiny finish. I am still happy to have this polish and it is so much fun to look back at my posts from 3 years ago, seeing my progress and all! What do you think of this polish? And do you still like seeing it after 3 years? This is a stunning polish- I love colors like this. UAU AMEI esse esmalte ... já esta na minha Lista de desejos! It is ♥ thanks dear! I do too! Dark and vampy ♥. :D pretty huh? So glad to have this in my stash. Awww thanks Lani, that's really sweet of you! Yes you may! I am guessing Midtown Magic? Keeping the bottles side by side shows that Midtown Magic is more of a mahogany color, warmer and more red toned, but the shimmer shares a lot of resemblance! Great eye!